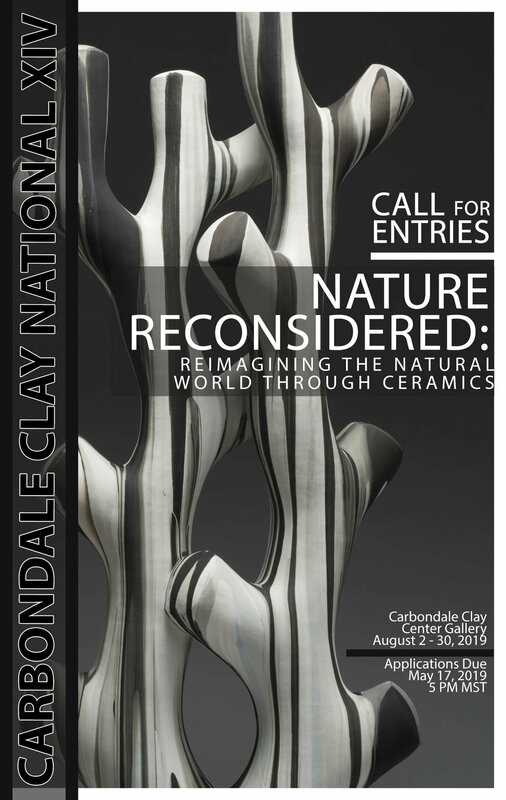 Carbondale Clay National XIV is a national exhibition of ceramic art held annually at the Carbondale Clay Center Gallery in Carbondale, CO.
Open to all types of ceramics / ceramic materials: utilitarian pots or sculptural ceramics. Clay should be the primary medium. All work must have been completed within the last two year, must be original, and must be for sale. The artist must own the sole copyright to the work of art. Substitutions of accepted works will not be allowed. All delivered work must match the juried image exactly. This submission of entries shall be understood to constitute an agreement on the part of the artist to all rules and conditions set forth below. Entries not meeting the criteria will be disqualified, and the entry fee will not be refunded. All works entered must be less than 3,000 cubic inches. Works requiring a pedestal must have a footprint less than 13" x 13". * All works must be installation ready with all necessary hanging hardware and or custom bases for specific three dimensional works, no exceptions. All wall works must be less than 20lbs per section unless prior contact with Studio Manager is made about a piece’s size and weight. Extraordinary installation techniques are to be discussed and confirmed prior to sending work to the gallery. The exhibition organizers accept no liability for damage to pieces damaged by people interaction, or “acts of god”. It is recommended that any artist accepted into the exhibition purchase their own additional liability insurance, especially for any exterior works. All work must be available for sale. The is a 60% commission on all sales during the exhibition and payment will be made on all sold work within one month following receipt of payment from the purchaser. No work may be removed from the gallery until the close of the exhibition, and prices quoted on entry form may not be changed after acceptance. Accepted artists will receive instructions for shipping or hand delivery. Shipping costs and insurance to and from the exhibition locations are the responsibility of the artist. An account number that can be charged for return shipping via UPS or FedEx is mandatory, or prior arrangments must be made with exhibition staff for in-person delivery and in-person pickup. All in-person deliveries of works must have suitable containers and packing materials, in addition to proper unpacking, installation, and repacking instructions are required and should be included for each accepted work. No styrofoam peanuts when possible. *Any questions regarding the size and design feasibility, or how to properly pack your work please contact Matthew Eames, Studio Manager, at studio@carbondaleclay.org BEFORE you send in your application. Thank you for you applying to the Carbondale Clay National XIV. Please send your images to studio@carbondaleclay.org AND complete payment. 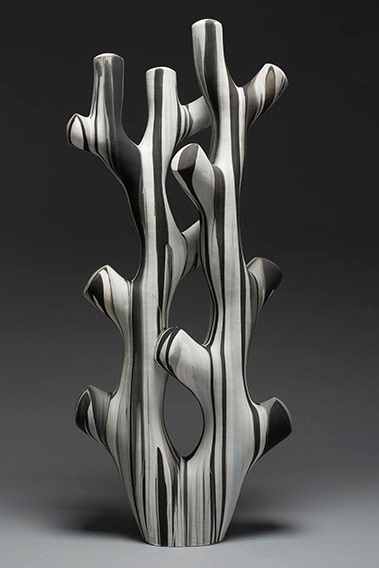 Trey Hill, Beginning of Sight, Ceramics, 2019. Trey Hill is a professional sculptor and Associate Professor at The University of Montana where he teaches ceramics and sculpture. He received his BFA from Bowling Green State University in 1999 and his MFA from San Jose State University in 2002. His work has been shown in galleries and museums throughout the United States and internationally. Trey has extensive travel and creative experiences through his vast artist residencies including: The Archie Bray Foundation in Helena, MT; the LH Project Joseph, OR; Da Wang Cultural Highlands, DaWang, China; HAP Studios, Beijing, China; Fule International Ceramic Art Museum, Fuping, China; and the Rojal Art Laboratory, Roja, Latvia.